Luís Alves de Lima e Silva was born on August 25, 1803. In 1818, he was admitted into the Royal Military Academy in Rio de Janeiro. However, he never graduated, dropping out in 1821 and enlisting in the 1st Fusilier Battalion. Luís Alves participated in the Brazilian War of Independence, the Cisplatine War, the Regamuffin War, the Platine War and quelled a number of rebellions in the Brazilian Empire. In 1840, Emperor Pedro II granted him the title of Baron of Caxias. The title commemorated his recapture of the town of Caxias from the rebels. Caxias became commander-in-chief of the Brazilian Army in 1866, during the Paraguayan War. He also served three terms as Prime Minister of Brazil (in 1856-1857, 1861-1862 and 1875-1878). In 1869, Pedro II raised him to duke. The birthday of Luís Alves de Lima e Silva was declared Soldier's Day in 1925. 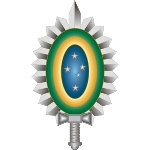 The holiday focuses on honoring the Brazilian Army. On this day, Brazilian soldiers pay homage to Duke of Caxias who is regarded as a soldierly ideal and one of the greatest officers in the military history of Brazil.